Aashna Wadhwa was worried her 2-year-old son’s high fever and cough might be an indication of the flu. “I had been reading about seasonal flu in children and I wanted to be better informed about the condition,” said Aashna. Viraj’s condition worsened as he started having breathing difficulties and even noisy breathing at times. He was immediately referred to a pediatric pulmonologist. Aashna was worried her son was very sick when they were referred to a specialist. She asked the doctor questions concerning Viraj’s condition and how serious it was. Difference Between Swine Flu And Regular Flu? What causes seasonal flu in children? Upon investigation, Viraj was diagnosed with the flu. Aashna asked the doctor what could have caused her child to get sick. 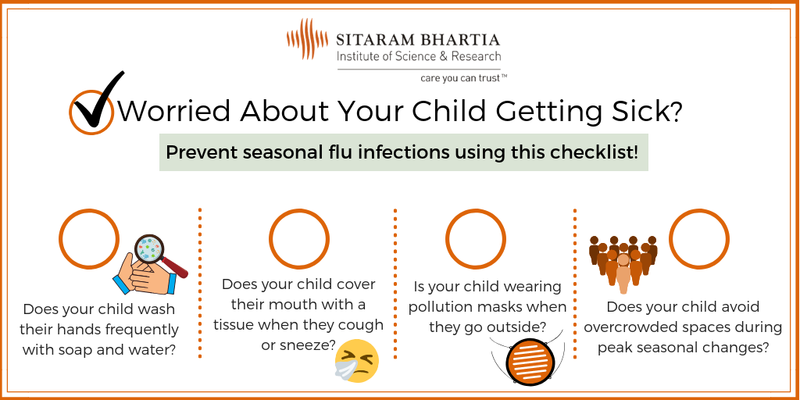 “Influenza, commonly known as the flu, is a contagious respiratory infection caused by a virus,” said Dr. Mandeep Walia, Consultant Pediatric Pulmonologist at Sitaram Bhartia Hospital in Delhi. The influenza virus outbreak happens every year, especially in the winter season. “Children have a natural tendency to explore and may touch contaminated things through the day. At their age, their immune system is still developing, and that makes them vulnerable to catching a virus,” reassured Dr. Mandeep. Seasonal flu in children can spread when they come in contact with siblings, parents, playmates, etc who might have germs in their nose, mouth, eyes, or sometimes skin. Some germs can stay on surfaces like toys, doorknobs, or a used handkerchief for many hours. These germs can be picked up by children when they touch these surfaces and then touch their nose or mouth with contaminated hands. The virus can also be inhaled through the air. Your child can be at risk of breathing in these germs when a sick person sneezes or coughs and releases them in the air. How do you know if your child has the flu? Seasonal flu in children manifests in various forms depending upon the spread and location of infection in the breathing tract. “In very young children, the flu can cause more serious illnesses,” counseled Dr. Mandeep. What is the difference between swine flu and regular flu? The cause for the regular flu is the influenza virus, which presents symptoms in the form of a sore throat or runny nose. Influenza is more common, so much so that people build up immunity against it. Commonly called ‘swine flu’ as it was earlier discovered in pigs, this is a condition caused by the H1N1 virus. As a new flu strain that emerged in 2009, swine flu can be transmitted from person to person through droplet infection. Be vigilant – watch for swine flu symptoms in children. In case you notice your child exhibiting these signs, consult a pediatrician immediately. Even if someone in your family is detected with the H1N1 virus, take your infant to the pediatrician as they may be given medicine for preventive treatment. Don’t panic and take action early – not all children with swine flu will need anti-flu medication. Opt for an assessment today as your doctor will guide you towards your child’s optimum care. How do you treat flu in kids? “So what should I do if my child has the flu?” asked a clearly worried Aashna. For children whose flu symptoms aren’t severe, plenty of bed rest and fluid intake is advised. Steam inhalation and fever relief preparations also aid the healing process. For children more than 1 year of age, licking a small amount of honey also helps soothe the flu symptoms in child. In Viraj’s case, Dr. Mandeep focused on easing the symptoms since antibiotics weren’t effective against viral infections. Consult your doctor about any side effects of over-the-counter medication before giving it to your child. It is important to note that these medicines can only bring relief and don’t cure the condition. Keep in mind that children with prolonged flu symptoms for more than 3-5 days or those with rapid deterioration in their condition should seek help from a doctor. In these circumstances, your child may be advised to undergo tests such as nasal swab examinations or chest X-rays. How to prevent seasonal flu in children? It is important to note that the flu vaccine does not guarantee prevention from all flu viruses. However, the vaccine is the best protection for young children and adults at a high risk of influenza. Thorough and frequent hand-washing to prevent common infections. Covering your mouth when you cough or sneeze with a tissue to avoid spreading germs. Wearing masks to help filter the air and reduce the likelihood of falling sick. Follow these preventive measures – save this image or take a screenshot of this checklist for your personal use! Reassured, Ashna made it a point to follow the doctor’s advice and noticed a slow improvement in Viraj’s health. “I cannot explain how relieved I was to notice an improvement in my child’s breathing. I’m glad I didn’t wait too long to see a pediatric pulmonologist,” she said in a follow-up consultation. Learn more about conditions treated under Pediatric Pulmonology.